If you can’t afford to get set up with drip irrigation in your own garden, there is a cheaper alternative. It’s more labor intensive when it comes to watering, but it’s pretty awesome in my opinion. That, my friends, is the sawed off end of a 5-gallon bucket. And it’s an amazing, multipurpose addition to your garden. It makes watering very easy – just use your wand or scoop a couple of big scoops of water into the ring and it concentrates it at your plant’s roots. It holds fertilizer and/or pesticides where you want them. It protects young seedlings or transplants from crazy windy days. It’s just overall awesomeness for relatively little money and effort. My dad has always used rings in his garden, which is where I got the idea originally. But he makes his out of sheet metal, which strikes me as incredibly dangerous when you have little ones running around and “helping” in the garden like we do. I can still remember one winter when our dog stepped on a snow-covered ring and lacerated her paw pretty badly. So I wanted to come up with a safer alternative that was just as awesome. First off, to make these rings you will need: a 5-gallon bucket, a drill with a heavy duty drill bit (like 1/2 inch), and a reciprocating saw (or a hacksaw and a lot of patience). It also helps to have a spare set of hands. 2) Take your drill and drill a hole on your line. You’ll also need to drill a hole at the bottom, just above the solid bottom of the bucket. 3) This is when it’s handy to have a helper. Using your reciprocating saw, cut around the circumference of the bucket. The DreadBrewer holds the saw and I help rotate the bucket. 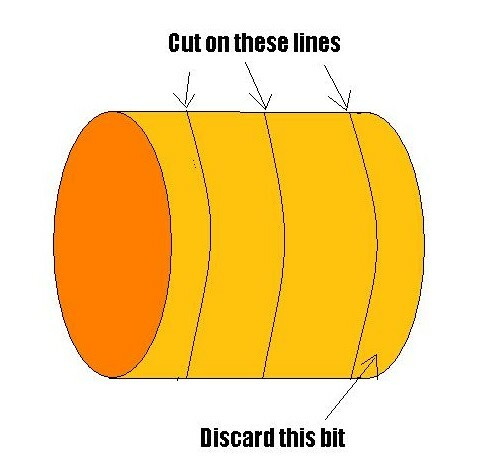 Repeat this process to make 3 rings, ultimately cutting off and discarding the bottom of the bucket as well. My incredibly accurate drawing above makes it look like you’ll throw away a lot of the bottom of the bucket – try to get as close to the bottom as possible so the discarded bit is as thin as you can get it. Ideally, you’ll waste very little of your bucket’s height. 5-gallon buckets are what -like $2 at Lowe’s? Super cheap! And you get 3 rings out of each bucket. 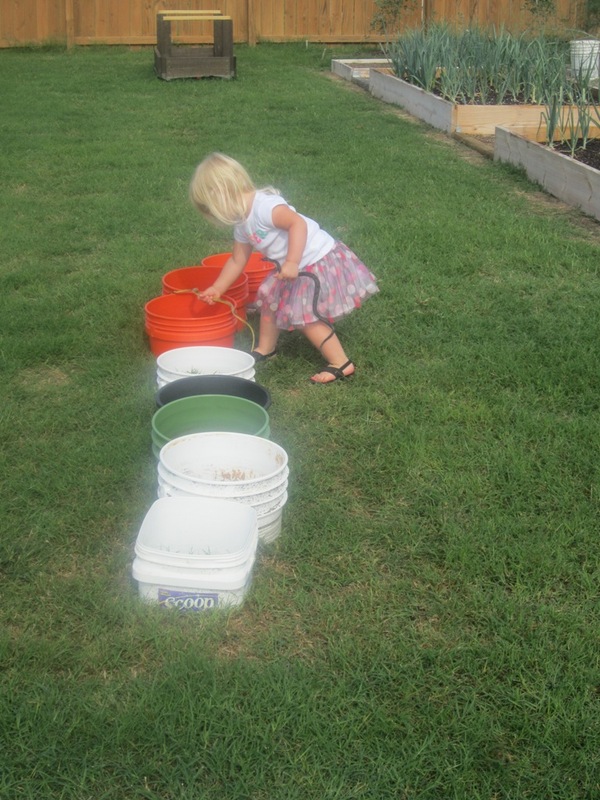 The top ring of the bucket (with the lip) is the best and easiest to put in the ground, but all of the rings are equally useful. We still have quite a few that we use, even with the addition of drip irrigation, because they’re just too good to give up. 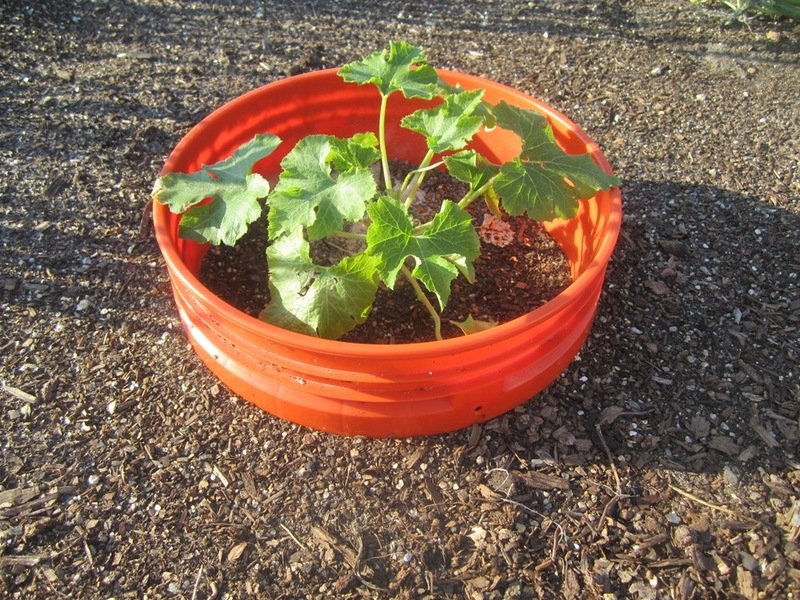 So if you’re looking for a cheaper alternative to drip irrigation, give the humble 5-gallon bucket a try. And as an added bonus, the rings that aren’t in use provide hours minutes (let’s be honest, people) of entertainment for your toddler! This entry was posted in Gardening and tagged DIY, Drip Irrigation, Gardening Tips by BrewsterMama. Bookmark the permalink.